Mini's biggest model ever is also it's first ever plug-in hybrid. The 2017 Mini Countryman was just unveiled online ahead of its official world debut at the 2016 Los Angeles Auto Show. As expected it is bigger, with total length growing by an impressive 8 inches. It is also 1.2 inches wider and sports a wheelbase that has been extended by 3 inches. 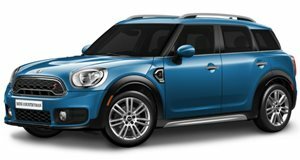 The result is a car that looks smaller than it actually is from the outside, with Mini claiming the 2017 Countryman offers five “fully-fledged seats.” We can’t speak for the space in the second row, obviously, but the automaker says there’s more room than before. Inside there is a 3.8-inch increase in leg room for second row passengers, and cargo space is up by 1.1 cubic feet with all the seats up and 5.4 seats with the second row folded down. In the press images Mini provided there looks to be a fair amount of real estate for both people and matching sets of luggage. Powering this newly enlarged Mini are four engines, two of which are diesels and likely won’t make it to the US. The two gas options are as follows: a 1.5-liter turbocharged three-cylinder making 134 horsepower and 162 lb-ft of torque in the base model and a 2.0-liter turbo-four good for 189 horsepower and 207 lb-ft of torque in the S trim. Since this is Mini a six-speed manual will be on offer, in addition to an eight-speed auto. Oh, and there's a plug-in hybrid on offer, but you already knew that. The Cooper S E Countryman All4 (what a mouthful) pairs the 1.5-liter turbo three-cylinder engine with an 87-horsepower electric motor (powering the rear wheels) for a total output of 221 horsepower and 284 lb-ft of torque. The base 2017 Countryman will do 0-60 mph in 9.5 seconds whereas the S will make the sprint in 7.3 seconds (manual) and 7.2 seconds (automatic); AWD cuts those last two times by 0.2 seconds. As expected the hybrid leads the way with a 0-60 mph run of 6.8 seconds. The plug-in Countryman’s 7.6 kWh lithium-ion battery is mounted underneath the rear seats and provides 24 miles of fully electric driving at speeds of up to 77 miles. The 2017 Countryman is set to launch next March, with the hybrid arriving a few months later in June. We’ll learn more about both the newest Mini when it takes the stage at the 2016 Los Angeles Auto Show. Here’s hoping that picnic set pictured with the new Countryman is available as an optional extra.